I love nachos, don’t you? The melted cheese? Against the backdrop of a crispy tortilla chip? And the mushiness of the refried beans???? I am on a perpetual diet and I am always looking to make fattening things less fattening and nachos are definitely not at all a diet food staple. My mission? 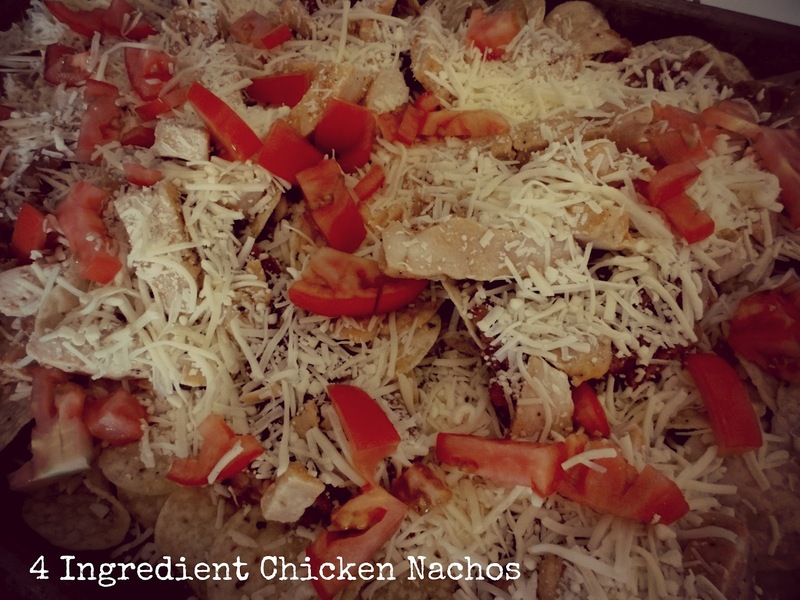 Make nachos healthier and four to five ingredients total. Do you think I can do it? You could also add condiments here- low-fat sour cream, avocado, etc….your choice! After you cook your chicken, chop it up and set aside. Spray a cookie sheet with cooking spray or put olive oil on a paper towel and wipe the sheet with that. Place the tortilla chips on the cookie sheet. Top with the refried beans. Then add the chicken, tomato (chopped) and the cheese. If you wanted to make this healthier, you could make your own refried beans. I made my own refried beans for the first time a month ago and it turned out awful but I think I just haven’t found the right recipe yet. If you have a good recipe for refried beans, please let me know! 1- chicken you could use pre- cooked chicken strips or cook two chicken breasts and chop them up. You choose. 2- shredded cheese for this recipe I used Velveeta's shredded Queso Blanco. You could use your favorite cheese though but I would choose either a Mexican blend or Monterrey jack. You could also add condiments here- low fat sour cream avocado, etc....your choice! Yum! I made this for dinner last night! Delicious! Thanks for the recipe, Kari! this looks great- I bet it would be yummers with leftover grilled chicken and a dusting of cumin!